A global leader in open die forging and one of the world’s last remaining Forgemasters. Located in Bethlehem, PA, USA and in operation for more than 125 years, Lehigh Heavy Forge provides forged components to the power generation, pressure vessel, oil and gas, defense and metals industries. Core competencies include custom forging, heat treating, and machining. With over a century of experience, Lehigh Heavy Forge has earned the elite status of Forgemaster. 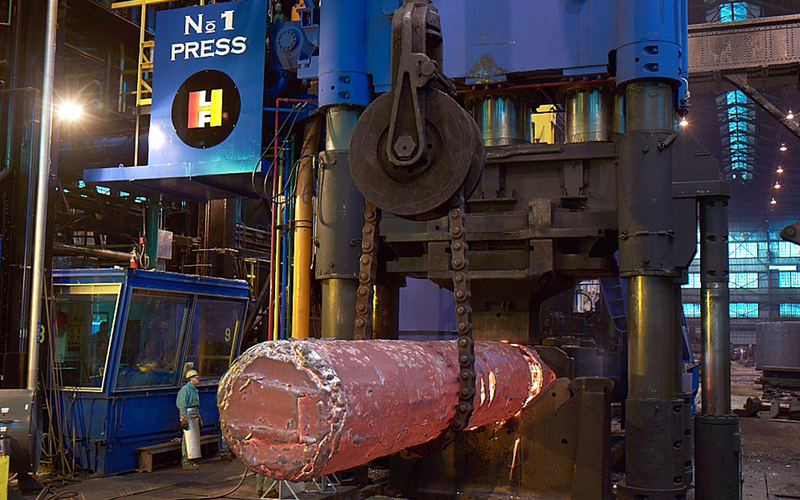 Starting with ingots up to 285 tons, our 10,000 ton open die hydraulic press produces the largest forgings in the western hemisphere with ship weights exceeding 166 tons. In addition we also operate a 3,000 ton open die hydraulic press for work roll forgings, billets and smaller forgings of various configurations with ship weights starting at 10 tons. Starting with ingots up to 260 metric tons, our 9,072 metric ton open die hydraulic press produces the largest forgings in the western hemisphere with ship weights exceeding 150 metric tons. In addition we also operate a 2,722 metric ton open die hydraulic press for work roll forgings, billets and smaller forgings of various configurations with ship weights starting at 9 metric tons. Interested in joining Lehigh Heavy Forge or exploring opportunities within the WHEMCO Family?